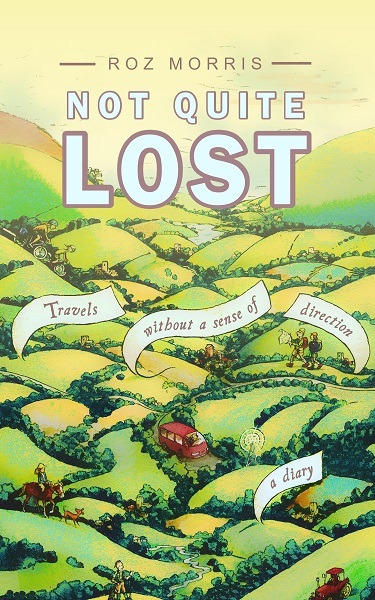 I’m delighted to welcome Roz Morris to the blog again, this time in a video interview about her new book Not Quite Lost, Travels Without A Sense of Direction which is published Monday, 2nd October 2017. Roz is one of the most popular guests I’ve ever invited here, and I was genuinely thrilled to have the chance to bring this lovely little volume to your attention. As well as Not Quite Lost, we talk around the subject of writing stylish and evocative prose and how it came to pass that Roz, best known for her career writing novels and helpful books for other writers, decided to write a travel book in the mould of Bill Bryson. We talk about story arcs, about the curious experience of strangers noseying around the place you’re staying in, and the excitement of finding unexpected nooks, crannies and unexpected vistas in delightful old buildings. We cover a lot of ground, from Roz’s self-confessed affinity for 1970s Dr Who programmes to examining her love for quirky characters and places with personality, the hold that old family homes can have on us and how her skills as a developmental editor have helped her to craft what I believe is one of the most perfect little books I’ve ever read. I read out a few short passages during the interview, but I recommend you buy the book for yourself – it’s a little jewel. You can read my (and other people’s) reviews on Goodreads here. So, sit back and enjoy the ride as we talk not just about Not Quite Lost, but also the writer’s journey and our shared love of language. Buy Not Quite Lost on Amazon here. Also available from other retailers in digital and paperback formats. Thanks so much for inviting me, Henry – and for helping me mind my French Ps and Qs!